Hydrate combination-to-oily skin while fighting visible signs of ageing with this powerful duo. As skin ages, it can become dehydrated, even if you have oily or combination skin. This powerful duo tackles hydration as well as fighting breakouts and visible signs of ageing. Formulated with hyaluronic acid, Resist Antioxidant Serum delivers weightless hydration to the skin, while niacinamide minimises pores and fades past breakout marks. 1% Retinol Booster dramatically improves the appearance of wrinkles, loss of firmness and uneven skin tone. Together, this anti-ageing booster and serum will leave you with clearer, softer, younger-looking skin. Use 1% Retinol Booster and Resist Antioxidant Serum after cleansing, toning and exfoliating. You can mix the booster and serum, or use them one after another. At night finish with a night cream, in the day follow with a moisturiser that contains a broad-spectrum sunscreen rated SPF 30 or greater. New to Retinol? Allow your skin to get used to retinol by gradually building up usage of 1% Retinol Booster - no more than a pea-sized amount up to 3 times per week to start – and adjust based on your individual experience. Powerhouse ingredient that can improve a variety of skin concerns, most related to visible signs of ageing: It’s skin-restoring, wrinkle-smoothing, an antioxidant and improves sun damage. Please check the individual products for ingredient listings. Can I use 1% Retinol Booster when I am pregnant or breastfeeding? Due to the higher amount of retinol being closer to the strength of prescription retinoids (which are contraindicated for use while pregnant or breastfeeding), we advise against such use unless OK’ed by your doctor. If your physician does not provide a clear answer, it’s generally best to be cautious and refrain from use until you are no longer pregnant or breast feeding. What is the difference between 1% Retinol Booster and Clinical 1% Retinol Treatment? Both contain high-level 1% retinol and are formulated with peptides and a significant amount of antioxidants and anti-irritants. Where they differ is in terms of texture, usage and which skin types they are suited to (although they can both be used by all skin types). 1% Retinol Booster has a fluid texture that allows it to be mixed in with your favourite serum or moisturiser. Its formula is thinner, lighter, and especially well-suited for normal to oily or breakout-prone skin. Adding 1% Retinol Booster to your serum or moisturiser allows it to work more gently on your skin, so you can use it more frequently – even as a daily part of your routine. Clinical 1% Retinol Treatment has a creamy lotion texture that is best for normal to dry skin. It’s an intensive, high-percentage retinol treatment ideal for a regular retinol user who is looking for powerful results. It’s best to slowly add this to your routine – no more than a pea-sized amount up to 3 times per week to start – and adjust based on your individual experience. 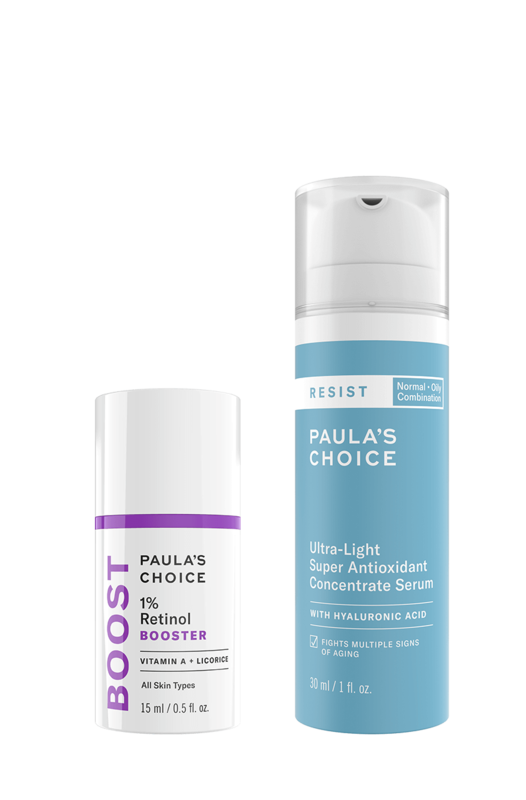 Can I use 1% Retinol Booster if I am using other Paula’s Choice products that contain retinol? Yes, although you may wish to alternate them - this will depend on how your skin responds. You can also apply your usual retinol product (serum or moisturiser) all over your face and neck, then apply 1% Retinol Booster to areas showing more advanced signs of ageing e.g. crow’s feet, laughter lines, expression lines and brown spots. Resist Ultra-Light Super Antioxidant Concentrate Serum is our only water-based serum (our other serums are silicone-based), and it is the lightest serum in the Resist line. Its blend of potent antioxidants and skin-repairing and cell-communicating ingredients helps fight multiple signs of ageing without feeling slick, greasy or heavy on combination-to-oily skin. Because oily skin tends to also have enlarged pores, this serum was formulated with ingredients that help normalise pore function. It also contains anti-irritants which reduce redness from acne and acne marks. Every Paula's Choice serum contains an effective blend of antioxidants and skin-repairing and cell-communicating ingredients to restore skin and significantly reduce wrinkles, increase collagen production and improve skin tone. You will be getting anti-ageing benefits regardless of which one you choose! Select the best serum for you based on your skin type and chief concerns, plus texture preference.